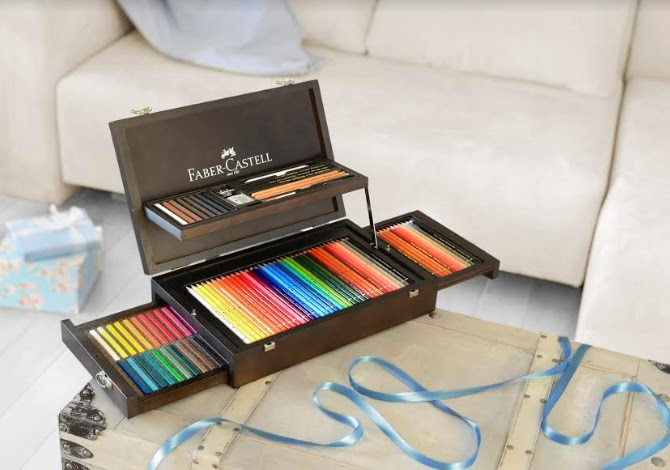 Mumbai: Faber-Castell, World’s largest and oldest manufacturers of art material introduces Mahogany Vaneer Case. Albrecht Durer watercolour pencils 36 Polychromos pencils 36 Polychromos artists’ pastels. The wooden case has been designed for painting and drawing. These easy to use watercolour pencils can also be used by untrained artists as well as professional. The paint becomes permanent when dry, enabling other layers of colour to be superimposed without causing it to dissolve again. It is easy to store or to transport. You can take it anywhere and get inspired wherever you may be. These pencils provide artists with great versatility of expression when drawing, shading and painting in watercolours. Priced at Rs. 75,000 its available at Faber Castell. They also introduced Colouring Kit for Relaxation & Premium Gifting Range (Paint by Museum Series) recently. Colouring Kit for Relaxation cultivates creativity, helps destress, enhances focus, its easy and fun and has the therapeutic value to it. Inside the Relaxation Pouch they have 14 premium farmable cards with bold & unique design to intrigue Concentration, Creativity, Peace & Energy busting stress so that one is not tired & bored of Colouring, 20 smooth & bright colour markers. The colours for these markers have been rightly chosen keeping in mind Colour Therapy & also to make colouring fun. Museum Collection is inspired by a collection of paintings done by famous Artist. To inspire Creativity and help Young Artist develop Talent. To educate, shape-up & teach young artist to recreate the techniques used by the Masters. You can avail the same at Toys R Us at a price point of 599.